This is a draft of the Constitution of World Federation. This draft has not been completed yet. But basic thought is shown. Basic thought of the Constitution of World Federation is based on a paper "International Party for the World Government". Basic policy is to directly elect the delegates of each country in proportion to population and send them to the World Parliament. The World Parliament that is proposed in the above paper is composed of 2 houses, and each house has basically 1,000 members. But the World Parliament that is proposed in this Constitution has only 1 house that has basically 1,000 members. Basic feature of the World Federation in this Constitution is as follows. Supreme authority in the World Federation is the World Parliament. World Parliament appoints and dismisses the Prime Minister of the World Government and the judges of the World Court. Registered Members of the World Parliament may object to the membership of other inappropriate registered members. Basic benefits of the World Federation is written in the preamble of the Constitution also. 1. World Federation can reduce or prevent the war. This will lead to the reduction in death and wound of people by war, in the destruction by war, and in the military expenditure. 2. World Federation can issue the international common currency. This will lead to the removal of fluctuation of exchange rate. 3. World Federation can provide employment to all the people. This will lead to the eradication of poverty. For further explanation of these benefits, see the World Party Declaration. Thus, establishing the World Federation is a political policy but at the same time it is the most effective economic policy. Especially, these benefits are important for developing countries. The following figure shows the process of establishment of World Federation. On the first stage, World Parliament is established following the "World Parliament Statute". The World Parliament on the early stage is a consultative assembly without the legislative power. This is similar to the European Parliament. So each country and region remains independent and has no duty to follow the decisions of the World Parliament. If this World Parliament works well, it will be vested with the legislative power and enact the Constitution of World Federation. Like this, from the World Parliament without the legislative power, it will become the true World Parliament. Each country conducts election and sends delegates according to its seats. A numerical example of apportionment of seats is as follows. It is assumed that the world population is 6 billion 829 million and 297 thousand, of which China has 1 billion 345 million and 751 thousand, India has 1 billion 198 million and 3.3 thousand, USA has 314 million and 658.8 thousand, Japan has 127 million and 156.2 thousand, and Assumed Country has 1 thousand. Total number of seats is basically 1,000, and the seats are apportioned in proportion to population. In principle, 1 delegate can have 1 vote. So, in principle, the number of delegates is equal to the number of votes. So, in case of China, the votes are 197.0556. Similarly, India has 175.4212 votes, USA 46.0748 votes, Japan 18.6192 votes, and Assumed Country 0.0001 vote. This is adjusted into integer by rounding up or down the first decimal place. The first decimal place is rounded up if it is not zero, and it is rounded down if it is zero. In case of a country that has vote less than 1, the decimal place that is not zero and the largest is rounded up. In case of China, the first decimal place is zero. So, it is rounded down and the adjusted votes are 197.000. So, the official delegates are 197. In case of India, the first decimal place is not zero. So it is rounded up and the adjusted votes are 176.000. And so the official delegates are 176. In cases of USA and Japan, the adjusted votes are calculated similarly, and the official delegates are 46 and 19 respectively. In case of Assumed Country, population is 1 thousand. So, vote is only 0.0001. In this case, the fourth decimal place is not zero. So, this is rounded up to 0.001. So, this country can send 1 delegate with 0.001 vote. By this measure, all the votes are classified into 4 classes, 1, 0.1, 0.01, and 0.001. Therefore, the total number of votes is basically 1,000, but the actual total number of delegates and that of votes are slightly more than 1,000 respectively. Thus, this policy is to get the support of people by electing the delegates from each country in proportion to population. This is a policy based on the thought that only the support of people can establish and maintain the World Federation. Election of delegates to the World Parliament in each country must be implemented fairly and transparently. Successful candidates of each country must get registered with the World Parliament at least 1 year before the opening of the World Parliament. The number of registered members (registered successful candidates) from each country can be 3 times as many as the number of official delegates. For example, if the number of official delegates of a country is 10, the country can register 30 members with the World Parliament. From among these 30 registered members, the country can send 10 delegates as the official delegates. For example, Japan will register 57 members with the World Parliament. On the other hand, USA will register 138 members. Even if only 2 countries register the members, it can form a part of the World Parliament. Other countries can join later. Thus, a part of the World Parliament can develop to the entire World Parliament. In case of the table above, registered members of China are 591, India 528, USA 138, Japan 57, and Assumed country 3 respectively. Term of membership is 4 years from the day when the President of the World Parliament declared that the first session of a term has been opened. When the term is finished, members may get registered more than 1 time if they are reelected in each country. Registered members of the World Parliament may object to the membership of other registered members if other registered members have a problem. So this system enables the World Parliament to have a strong authority. This system is shown as follows. If there is a problem in a registered member, other registered members may object to the registered member. For example, if a registered member was not directly elected by people, other registered members can object to it. When a registered member objects to another registered member, the member who objects shall send a document of objection with her or his name and clearly specified reason to the President of World Parliament. If the objections reach 5 percent of total votes of all the registered members, the President shall send the documents to each registered member, and a motion to dismiss the objected registered member shall be made in the session of the World Parliament. In the session of the World Parliament, when the attending delegates, with more than half of the total votes of attending delegates, object to the dismissal, the objected registered member shall not be dismissed. Otherwise, the objected registered member shall be dismissed even if the objections by document are only 5 percent of total votes of registered members. In the process of voting for dismissal, the maximum number of votes of each country is, basically, up to 20 percent of total votes of attending delegates. For the detail of calculation, please see the Statute. The registered members from each country and region must be those directly elected by people. So, even if a country under dictatorship registers the members without election, they will be objected by other registered members and dismissed following a procedure stipulated by this Constitution. Thus inappropriate registered members of the World Parliament are dismissed by other registered members. By this system, even if 3,000 members have been registered, the registered members may become only 10 members due to the objection. Furthermore, it may take 3 years from 4 years of term of office to complete the process of dismissal. But this remaining 10 members will become the definite authority, and the resolutions that the 10 members pass in the remaining 1 year of the term of office will get the supreme support of people. In the Constitution, the system of the World Federation is not under the separation of three powers, the legislation, the administration, and the judicature. 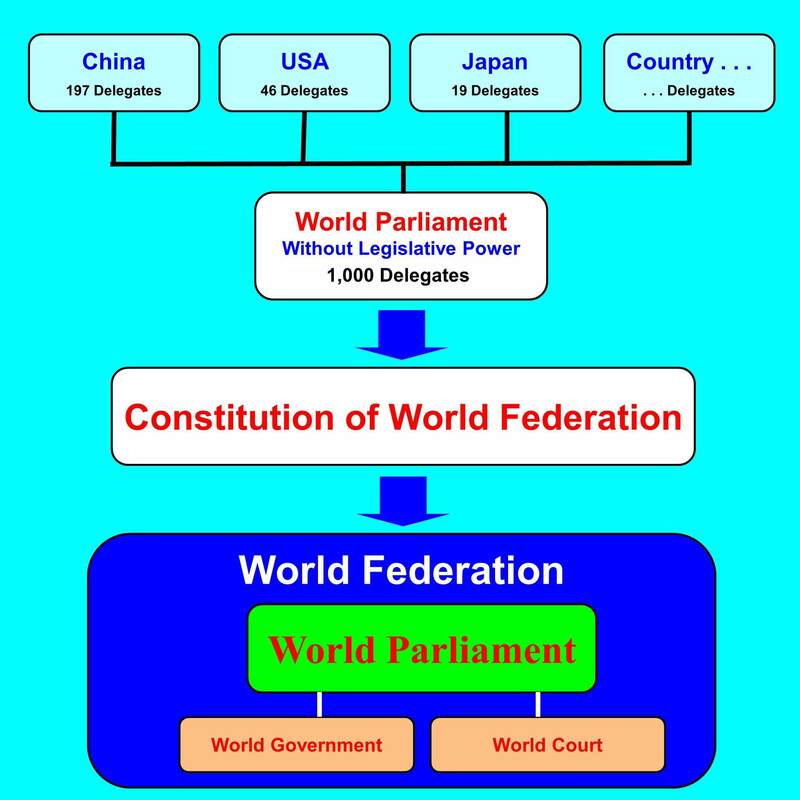 As shown in the figure, the World Parliament appoints and dismisses the Prime Minister of the World Federation and the judges of the World Court. Thus the World Parliament is the supreme authority in the World Federation. In these days, most countries and regions send representatives to the Olympic Games. So it does not seem impossible to send the representatives to the World Parliament.